Talented author Michael Salmon has a vast range of achievements. He’s been involved in television and theatre since 1967 with his Alexander Bunyip show on the ABC for ten years. In 2010, a bronze statue of Alexander Bunyip was commissioned by the ACT Government, which stands outside the Gungahlin Public Library. He has written and illustrated over 160 books. 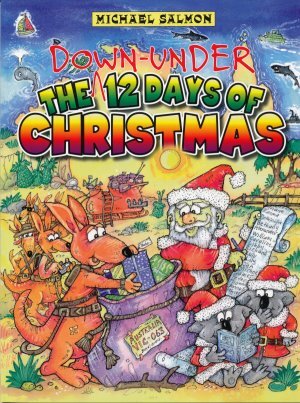 In his latest book The Down-under 12 Days of Christmas, Salmon’s wonderfully entertaining illustrations bring visual life to the Aussie song that children love to hear and sing. A kookaburra in a gumtree (with a black hat that matches his beak); two snakes on skis (spotted and striped snakes on yellow skis with glasses, and scarves flying in the wind) ; three wet galahs (pink galahs, throwing water on clothes hanging on the clothesline but getting washed themselves at the same time); four lyrebirds (preening themselves after being attended to by Mr Robert’s Robot Cleaning Service); five kangaroos (two painting the roof, one sitting reading the Bunyip Bulletin with his bucket and brush resting at his feet, one sweeping, and the last one taking notes). Six sharks a-surfing (on coloured surfboards with huge grins on their faces); seven emus laying (their facial expressions are priceless as they all watch an egg hatch! ); eight dingoes dancing (in full ballroom costume with partners); nine crocs a-snoozing (but their eyelids are half-open, teeth visible); ten wombats washing (in a bathtub with snorkels, bubbles galore, scrubbing brushes and rubber duckies); eleven lizards leaping (over a pole that rises higher and higher); twelve possums playing ( in a cool band called The Possum Band, under a tree). Then it’s ‘all together now’ and the whole song goes back to the beginning. Absolutely delightful! Each of the twelve numbers is introduced on a full page spread in full colour. The opposite page contains a smaller picture of the previous days’ animals and their antics. Along the bottom of each page is an array of colourful indigenous animals, changing position as the pages change. On the last double page spread, there are four pictures representing the stages of Christmas celebrations: Carol Singing - candles lit, decorations and expectations; Christmas Eve - Santa arrives with his presents and anticipates the goodies in the plate; Christmas Day – the excitement of opening the presents by the sea in the sun. And then Boxing Day –over-fed and tired, everyone has a good rest! There is a colour-in picture on page 32, to be photocopied and coloured in.